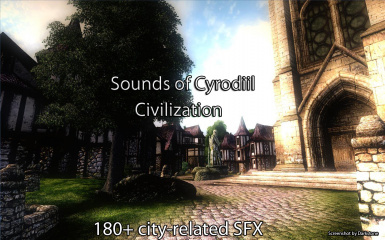 Sounds of Cyrodiil would never have been possible without the kind generosity of many authors on FreeSound.org. This website allows professionals and semi-professionals to upload sound samples under the Creative Commons Sampling Plus License, which allows users to download and use the sounds in their own projects as long as the author is credited for his work. In the spoiler tag are all the authors who contributed to Sounds of Cyrodiil. To know what sound effect they contributed, view the Credits file in the download. The OBSE team for passing through every barriers they see. Addition: Added the sound of rain hitting the roof heard from inside shacks and farmhouses. Addition: Added the looped sound of crickets heard from the houses’ windows in cities at night. Addition: Added the temples’ chants and atmosphere heard from the doorstep. Addition: Added 5 new snoring sound effects for more variety. Changes: Removed exterior doorstep tavern chatters from several wilderness inns. Changes: Updated the Open Cities Reborn to support SoC’s additions. Fix: Looped city chatter will not play when it’s raining. Fix: Removed a duplicate temple chant in Chorrol. Fix: Restored the original values for the scripts controlling the dungeon sounds. Dungeon sounds will no longer play every 10 seconds or so. Fix: Added more delay between tavern songs in high class taverns to prevent one of the songs from being cut while playing. Replaced Several of the tavern songs and re-arranged the existing ones. Turned down the volume on all sound effects. Replaced the "Rain Hitting Window" sound effect. Sounds of Cyrodiil's archive is now compressed in 7z format for smaller size. Instructions on how to install and uninstall are in the readme. 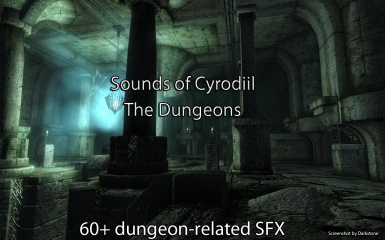 Sounds of Cyrodiil adds around 200+ sound effects to the game world that are played from 5400+ hand-placed sound emission points. It affects every cell, region and more in the game. From Civilization to the Dungeons; From the Wilds to Special Events, No environment is left soundless anymore. The time of day gives you a different atmosphere. So when walking in the city streets during the day, you'll hear the echo of people shouting in the distance, doors opening and closing, workers sawing things. While at night, cats fight for territory, dogs bark, drunkards yell. In dungeons, the enemy type that lives in them will make itself heard. In an undead infested dungeon, zombies moan and spirits yell. In a daedric cave, demonic voices are heard around you. Like most sound effects, there is a random delay between each sound and a random direction when it happens so you can never guess what sound will play next, when and where it will come from. Thus, keeping you on the edge in Dungeons and never bored in cities and taverns. The other main feature is being able to hear the outside from the inside. If you get close to windows inside buildings, you'll hear what's going on outside. If you're in a tent, you'll hear the wilderness around you. If you're in the entrance of a cave and look outside, you'll hear the birds and other animals going about their lives. If you're in your house and you look outside, you'll hear what's going in the street. Sometimes you might hear a noisy drunkard who left the tavern and even neighbors yelling each other to shut up as they're trying to sleep. In taverns, patrons chat, yell they want more wine, burp, cough or laugh out loud. When wandering on the city streets in the evening, walk by a tavern and you'll hear the activity from outside. There are also songs that are played in those fine establishments. Depending on the social class of the tavern (Low, Mid, High), you get a different song set and a different sound set. Patrons burp and yell more in low class taverns than in high class ones. In the Wilds, take a stroll on the Gold Coast and listen to the ocean waves hitting the shore. Climb mountains and listen to the wind becoming colder and louder as you get to the peak. Take a walk in the forest and hear small mammals running from you in the bushes and grass. In Special Events, certain quests or events have received some audio goodness. See in the detailed soundlist below for more information, since it contains spoilers. Finally, this mod would never have been possible without the contribution of many sound recorders and artists from Freesound.org. There's a file in the archive with the credits for everyone who made the sounds. A HUGE thanks to them, otherwise the sounds would not have been as high quality and as numerous as they are now. 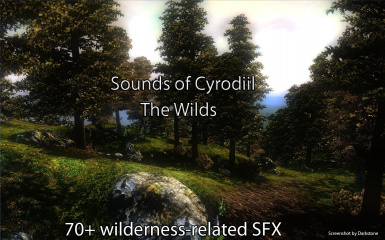 Sounds of Cyrodiil is about overhauling your Oblivion audio experience. It's about making the game pretty for your ears and immersion. You've got my ear citizen. I invite you to view and hear the video trailers that show each part of Sounds of Cyrodiil in action in the video section. At the very end of this description is the detailed soundlist if you want to know exactly what sounds have been put into this project. Sounds of Cyrodiil affects most in-game areas but other mods do a wonderful job to get the best audio experience in Oblivion. There are also visual mods that blend perfectly with Sounds of Cyrodiil because of the area they affect. Why: Storm & Sound allows you to hear the rain and thunder from inside buildings. It's even more immersive since SoC places sounds of rain hitting windows inside buildings. Why: Canderoc has provided an excellent sound mod that improves the quality of several sounds by tweaking them and enhancing their stereo. It also adds 42 new sound effects for thunder and wind. Why: The default bell sounds emitted from the cities' cathedrals only have a short range to hear them. This mod makes you hear them from all over the city and also from inside the cathedrals. Why: Atmospheric Oblivion adds new sounds to dungeons and the wilderness which add even more immersion when combined with Sounds of Cyrodiil. Why: This mod merges the best combat sounds improvements from other authors for a better, more visceral combat audio experience. Why: Not only does it greatly improve the weather system and visuals, but it also gives natural lighting to the indoors, allows you to look at the sky and hear the weather from the windows. Why: SomeWelshGuy has done an outstanding mod that allows you to look at the city streets from inside, greatly enhancing the immersion when you enter buildings. Immersive Interiors gives the possibility of looking at the streets while Sounds of Cyrodiil allows you to hear the city life from inside. A must with Sounds of Cyrodiil! Note that All Natural is required to run Immersive Interiors. In this section, I will update the list mods that have been patched to integrate Sounds of Cyrodiil's sounds and scripts. Instruction on how to install those add-ons and what they do specifically are included in their respective archive on the download tab. If you have a suggestion of mod you'd like to see with a SoC's version, let me know and I will gladly do it. Sometimes, it's possible that a looped sound will stop playing after you pause the game (Opening a menu, talking to people). Leaving the zone and entering again (Or reloading your game) will make the sound return. When the game is paused like above, no sounds will play except the weather or the NPC's voice. This is engine-related and cannot be fixed. When loading a tavern, it is possible that the tavern songs will switch during the loading screen. It returns to normal once you enter the cell. Looped sound effects that play at specific time will sometimes start playing when you enter the area they're in even though they're not supposed to play. These sounds will quickly fade out as you enter the cell. All of the sounds included in the list can be heard from inside if you're in a building where you can hear them. For instance, if you're in a farmhouse that has sheep nearby at night, you'll hear wolves or coyotes howling, owls, crickets and the sheep flock. Around 20-25 new bird sounds for forests, mountains, swamps and plains. Hear the impact of rain on tents. Insects flying-by your character's ears. Nearby birds flapping their wings and flying away. Cold, constant chilling gusts of wind in the mountains. 6 new short gusts of cold wind heard in northern Cyrodiil. Rare occurance of hearing an avalanche happening or a strange creature's scream echo in the Jerall Mountains. Rodents running in the grass at night. Calm and strong ocean waves on the Gold Coast and the coast south of Leyawiin. Water waves' impact on small embarkations and docks. Wolves howling in the distance. Rope bridges' supports and railing squeaking/being unstable. Bee nests in several locations. Water stream sounds for bodies of water where the waterfalls land and the stream themselves. There's a standard sound set for each type of dungeon: Cave, Ayleid Ruins, Forts and Sewers. These sounds play in these dungeons regardless of who or what lives in it. To spice it up, dungeons inhabited by Daedras or the Undead have their own sound sets in addition to the standard ones. Undead dungeons have zombies and wraiths screaming or moaning. Daedric dungeons have demonic voices or daedras screaming. Around 60 SFX for city streets. People shout, dogs bark, cats fight, doors open and close, children play, drunkards throw insults at neighbors who are trying to sleep. Bravil, the Anvil docks and the Waterfront have a soundset that consists of more "loud noises" such as people shouting/yelling, more dogs and cats fighting and a bit more drunkards to better reflect their situation. Listen to the Imperial City's Arena matches from outside. Listen to the taverns' activity from the doorstep. Around 40 SFX for taverns. People burp, shout, laugh, cough, break bottles or pull chairs. High Class taverns are quieter than the rest. Cold wind whistling through the windows from inside Bruma's houses and Cloud Ruler Temple. An echoed, looped ambience for castles, Imperial Library and the Temple of the One. Empty, echoed atmosphere inside cathedrals at night. On rainy days, listen to the rain hit the windows inside buildings. On rainy days, listen to the rain's impact when it lands on tents. Hear the blacksmith at work from the street if you pass by his front door or windows during opening hours. Potions boil where NPCs brew potions. Notably in alchemy shops, dungeons or Mages Guild headquarters. The Arcane University's purple torches now emit a more magical burning sound. More haunting sounds in Benerus Manor before exorcising the place. Hear the invisible spirit bang on nearby walls/doors, run towards you, climb the stairs or breathe in your ears. A zombie can be heard turning the handle, moaning and banging on the doors from inside Nerastarel's manor in Skingrad. Rats can be heard from the hole that leads to Arvena Thelas' house in Anvil...considering that they're still alive. Scamps can be heard causing mess from inside Rosentia Gallenus' House in Leyawiin prior to acquiring the Staff. Battle of Bruma: Soldiers yell as they charge the daedras then clash against them. In the midst of battle, a looping sound of soldiers screaming and clashing with the daedric forces is played. Upon victory, soldiers cheer you as you leave the Great Gate. Siege of the Imperial City: Soldiers fight, arrows flying-by hour head, explosions in the distance, the Imperial Legion's battle horns echoing on the battlefield.